Samtouch is the latest innovation in Point Of Sales Software which encompasses the features required by all major Retail & Hospitality sectors. 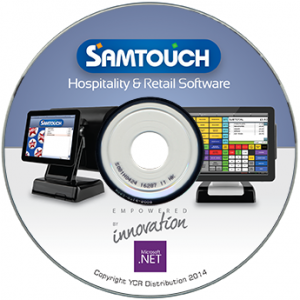 Developed on the latest Microsoft .Net Technologies, Samtouch is the leading edge Point Of Sale Platform which is ìEasy To Useî, reliable & a cost effective solution providing you with the management tools & information to allow you to operate & expand your business on your terms. For us, simplicity is the key to a successful EPOS solution. We believe that we break down barriers, remove unnecessary processes & promote transparency for the operator. We understand that your Epos System is a fundamental part of your business. From planning, design & execution of our software, minimising system critical down-time has always been our key aim. Creating real value is integral to what we do. We believe Hospitality EPoS Software – Empowered By Innovation our EPOS solution provides great value for money. We seek intelligence in all our technologies. Thats why we utilise the latest development platforms from Microsoft. This promotes innovation, faster development & boundless thinking. We understand that each business has unique requirements. Thats why we have developed many features to ensure our system is as flexible as possible. 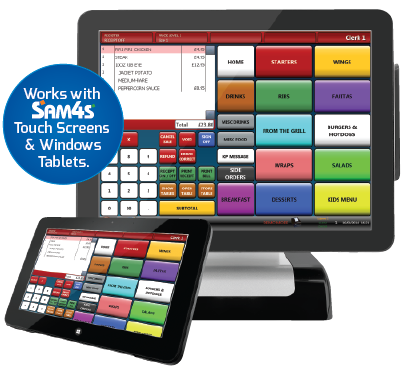 Samtouch utilises the latest technologies of your Sam4s Point Of Sale terminal to display eye catching & easy to operate touchscreen graphics at lightning speed. Promotional material & advertising banners can easily be displayed on your large LCD customer display, providing a no cost advertising portal at Point of Sale. Simple to use with minimal training required, new or existing staff will take to Samtouch quickly & confidently, saving you time & maximising your sales growth. Create added sales opportunities by prompting the operator to advise the customer about ìadd onî or alternative products again maximising every sales transaction. Promotions are a key features in all sectors. This is why Samtouch has been designed from the ground up with advanced promotional features that can be transparent to the operator. Samtouch integrates with Sage Pay & Payment Sense EFT Processing Portal, NMO accreditation for Weighing Scales, Samstock Back Office Management Software & view sales reports on your Android phone.